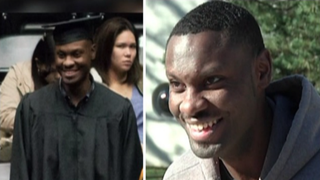 Joshua Woods (shown in his cap and gown, and on the right) could have given up when his parents died. Instead, he took his last $30 and applied to Wichita State University. He was accepted, and in December he graduated. When Joshua Woods' parents died, he was lost. "I was disappointed. Mostly in myself, but also at life," Woods told Fox 32. "I felt like I wasn't dealt a good hand to begin with. I was in foster care. My father passed away when I was 16. I was the only kid on my block with no guardian." At one point, Woods found himself homeless and sleeping on his sister's floor. Despite his setbacks, the Kansas man decided that he knew he could do better, so he took his last $30 and applied to Wichita State University. Woods got a job working overnight at a grocery store, and although he didn't have a car, he didn't let that stop him. Woods would run the 5 miles to school in order to attend classes. Woods graduated from Wichita State in December with a communications degree and hopes for a career in journalism. "It was hard to hold my tears as I walked across that stage," Woods said. "To be considered stupid all your life and you graduate from college with a bachelor's degree. … I don't know about anyone else, but it was a triumph for me." Read more at Fox 32.